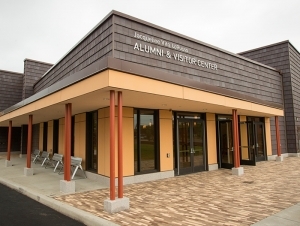 BUFFALO, N.Y. -- Buffalo State College will hold a ceremonial ribbon-cutting for the new $6.9 million Jacqueline Vito LoRusso Alumni and Visitor Center on Thursday, September 27, at 5:00 p.m. The 10,800-square-foot two-story facility is located at the corner of Rockwell Road and Grant Street, solidifying the college’s Grant Street entrance as the second main gateway to campus. The center, which will be a gathering place for alumni, will also serve as an information center for campus visitors and a starting point for prospective undergraduate students and their families embarking on campus tours. A combination of state grants and private donations funded the multimillion dollar project. The most significant donation was a $1 million gift from Jacqueline Vito LoRusso, '62, '64, who earned both her bachelor’s and master’s degrees in elementary education from Buffalo State. Owner of the rental property management firm JVL Management Company, LoRusso has long been involved with Buffalo State alumni events and has made previous gifts to the college. Inside, the center includes spaces for public receptions and gatherings. There is a large multi-purpose room with seating for 150, a conference room, an admissions presentation room, along with various support spaces. The Alumni Engagement Office is now located in the center. An outdoor seating and reception space on the north side of the building overlooks the Buffalo State campus. HOLT Architects of Ithaca, New York, designed the center, while construction was managed by Javen Construction Company Inc., of Penfield, New York. After earning her bachelor’s degree in 1962 and master’s degree in 1964 from Buffalo State, LoRusso taught in the Maryvale School District and at Elmwood Franklin School for many years. LoRusso now owns and operates JVL Management Company. She has served twice as a member of the Buffalo State College Foundation Board of Directors, including a current term held since 2010. During the 2012 Transforming Lives: A Campaign for Buffalo State fundraising initiative, she made a generous gift to fund scholarships through the Music Department. In recognition of that gift, the recording studio in the new music complex in Rockwell Hall was officially named the Jacqueline V. LoRusso Control Room and Recording Studio.